Many of us constantly worry about losing weight and staying healthy! We tend to want to hit the gym, lift weights, do cardio and take up running. But did you ever stop to think how this affects your lungs??? I bet your doctor never told you this… as you age, cells in your lungs start to die off faster than you replace them causing your lungs to shrink. And here’s the kicker: The smaller your lungs, the greater your chance of dying of ALL causes. But I have proof that it’s completely preventable… even reversible. YOU can make shrinking lungs and shortened spans of good health a thing of the past. With just minutes a day, you can use Dr. Sears technique to give you the lungpower of a 20-year-old. And with all that EXTRA oxygen and cardiovascular power, you’ll REAWAKEN the energy and vitality you had years ago – even if you’re past retirement. Powerful research from around the world reveals the deadly threat of lost lungpower. Dr Sears began to make connection between lungpower and strength back in the early seventies. When he discovered the pioneering work of Dr. Dean Ward, who uncovered clinical evidence connecting the loss of lungpower to aging. 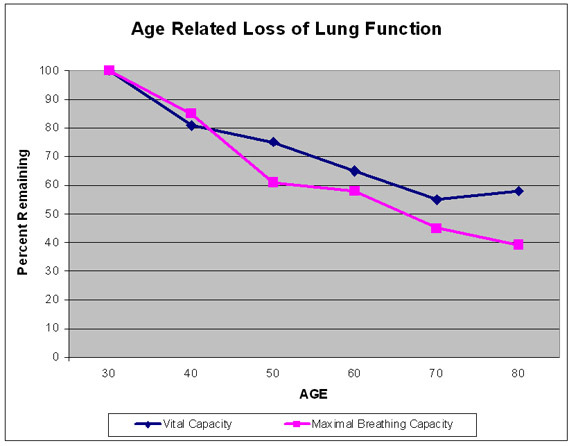 He even found that lung capacity is the key indicator of how long you’ll live. This should have shocked the medical establishment… but no one listened. Even now, mainstream medicine continues to ignore the vital importance of lungpower. Twenty years of clinical research points to the same thing: Loss of lungpower spells bad news for your strength, your heart, your health, and your brain. Even the simple act of getting off the couch can leave you breathless… and your body becomes a helpless target for any number of deadly diseases. Aerobic training – the kind most doctors and even the federal government tout as the path to good health – can actually wreck your body. Do enough, and aerobics will make you sick, tired and old before your time. Do you know how many times my patients have come to me thinking that aerobics and long-duration “cardio” are the best and only way to improve their heart and lungs. NOTHING could be further from the truth. If you exercise with aerobics, you are always working out within your current aerobic limits. You’re building endurance, but you’re not improving your aerobic capacity. With “cardio” and aerobics, you never push hard enough to stop to catch your breath. This kind of aerobic exercise trains your body for endurance and efficiency. That sounds great… but this actually causes your heart and lungs to shrink unnaturally. You get smaller muscles, smaller heart and smaller lungs. What’s worse, it wipes out your heart’s and lungs’ reserve capacity. And your reserve capacity is what your heart and lungs use to deal with stress. Injuries or physical trauma, a shocking emotional blow, a particularly intense session in the bedroom with your partner – these all demand reserve energy. Reserve capacity means your heart has the ability to pump more blood, faster in times of stress. Reserve capacity for your lungs allows them to deal with high exertion like lifting, carrying, running or climbing stairs. Without reserve capacity, you are much more likely to drop dead from a heart attack or pneumonia when faced with stress. No “reserve capacity” in your checking or savings account means bankruptcy. No “reserve capacity” in your heart and lungs means a fatal heart attack or succumbing to what should have been nothing more than bronchitis or “walking” pneumonia. The technique that Dr Sears developed builds reserve capacity for your lungs, your heart and your blood vessels… and gives you many other health benefits as well. Rebuilds Your Lungs – Even If You’re an Ex-Smoker. Builds Pounds of New Muscle – Without Lifting Weights. This technique is called P.A.C.E., and it proves once-and-for-all that traditional “cardio” is a waste of your time and just doesn’t work. P.A.C.E. shatters all the myths and misconceptions about health, aging and fitness. P.A.C.E. proves beyond a shadow of a doubt that a strong, disease-resistant body and vibrant health do NOT have to be difficult, time-consuming or boring. P.A.C.E. stands for: Progressively Accelerating Cardiopulmonary Exertion. By increasing the intensity and varying the duration of each interval according to the program, your heart and lungs get the right challenge they need to transform and stay fit and strong – well beyond the age of 100. Where long-duration exercise causes your heart and lungs to shrink, P.A.C.E. does just the opposite. P.A.C.E. builds up reserve capacity in your heart (the only way to avoid a heart attack) and triggers the expansion of your lungs (your ticket to a long, disease-free life). 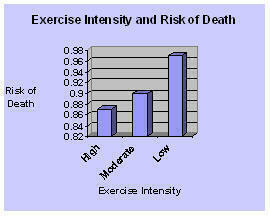 A groundbreaking study proves … intensity lowers your risk of heart disease – and your risk of death. A few years ago, researchers published the Health Professionals Study. After studying over 7,000 people they found that the key to preventing heart disease is intensity – NOT long-duration exercise. Those who followed the basics of P.A.C.E. program – short bursts of intensity, followed by short periods of rest – dramatically lowered their risk of heart disease. But that’s not all…In another study, intensity turned out to be the key to longevity and reduced risk of death.This study reinforces what Dr Sears discovered 20 years ago: long-distance runners have a higher risk of sudden cardiac death than other athletes. Dr Sears came to call this pattern the “Jim Fixx Phenomenon,” after the popular fitness guru of the 70s. Fixx claimed that the secret to heart health and long life was endurance running – up until he died of a heart attack – while running. Reinforcing that the “new science” from the 1960s that promoted jogging was a big mistake. Long-duration aerobic training doesn’t work. It isn’t natural and your body knows it. P.A.C.E. puts an end to the hardship of exercise. It super-sizes your lungs and bulletproofs your heart. Just what you need to prevent heart attacks and live a disease-free life.But the benefits of P.A.C.E. don’t stop there… P.A.C.E. is the most effective fat-melting technique there is. P.A.C.E. puts your body into “fat-melting” mode. Imagine flicking a switch inside your body that told it to stop making fat – AND melt off all the excess fat you currently had. Long-duration exercise melts fat during your workout. But this sends a message to your body that you need a reserve of fat available at all times – so the next time you exercise you’ll have something to throw on the fire. This self-defeating cycle ensures that your body stores more fat every time you finish exercising. That’s why you may have such a hard time dropping fat at the gym. Every time you melt fat during exercise, you body reacts by storing more. P.A.C.E. sessions can be as short as 10 to 12 minutes. This short duration helps re-train your metabolism so that you store energy in your muscles, and stop storing it as body fat. In fact, when you begin to do P.A.C.E., your body will start to get rid of its stored body fat while you rest and recover from your workout. This is called “afterburn.” In fact, your body continues to melt fat for up to 24 hours after you finish. After a while, your body stops storing fat all together – it simply doesn’t need to hang onto it anymore. This afterburn is the key to getting rid of excess body fat – not long hours of boring exercise. With P.A.C.E. you no longer need to worry about being overweight, becoming dependent on others, needing prescription drugs or fear getting sick. The P.A.C.E. program puts you in a league of your own. You can join this group yourself just by ordering: http://tinyurl.com/6vpzatb P.A.C.E. : The 12-Minute Fitness Revolution. It’s a lot easier – and faster – than you think. In the time it takes you to check your e-mail or drink a cup of coffee, you can do an entire P.A.C.E. session. P.A.C.E. is helping thousands of people from around the world, and will show you exactly what to do and why it works for so many people in so many places. And just like them, you get all the benefits of P.A.C.E. so you can transform your body and your health too. So don’t delay. Everything you need is right at your fingertips. Seize the opportunity and get started today. P.A.C.E. : The 12-Minute Fitness Revolution. To Order: http://tinyurl.com/6vpzatb Please share your thoughts by leaving a comment below. What’s The Secret To Health? The Secret is … There is NO Secret! Let’s remember the BASICS. Everyone should at least get their spine checked. After all, don’t you want to be Healthy? Let’s stomp out disease before it happens! Please share your thoughts and wonderful results of your chiropractic care by leaving a comment below. You’d have to eat 10 servings of spinach to get the same level of minerals from just one serving about 50 years ago. To help protect you from this tragedy, Dr. Sears has created a formula of powerful “green foods” that gives you the nutrient power of over 9 pounds of assorted vegetables – all from drinking a naturally fortified glass of juice or water… Just mix in 2 teaspoons and you’re done! If you want all those many benefits of fruits and vegetables, this breakthrough is very exciting news! For instance, just look at the US Department of Agriculture’s (USDA) nutritional values for fruits and vegetables today compared to 1975. And that’s bad news for your health… Magnesium regulates over 300 body functions every day and is so critical to heart health and healthy glucose metabolism. But the story doesn’t end there. Dr. Sears wasn’t the only one to realize your fruits and vegetables don’t pack the nutritional punch they used to… A report from the University of Texas in Austin, also tracked the decline of nutrients in produce. In every jar of Ultra Greens, you’ll find Dr. Sears’ own formula for restoring balance in your diet – AND the secret to astounding energy levels and a “bullet proof” immune system. Ultra Greens Works on a Cellular Level, Energizing and Revitalizing Your Entire Body – Delivering More Raw Energy and Immune-Boosting Power than any other Supplement on the Market Today! Healthy Weight Loss: When you have toxins in your body, they’re stored in your fat cells. Ultra Greens removes those toxins, literally “emptying out your fat cells” for dramatic fat loss results. Cardiovascular Health: Ultra Greens helps your body remove LDL (bad cholesterol) and maintain healthy triglyceride levels (blood fat). It also has the remarkable ability to maintain your blood pressure that is already within the normal range. Joint Support: Ultra Greens clears away the chemicals and toxins that cause inflammation. So far, Ultra Greens is one of the most effective long-term solutions for my patients with joint comfort and mobility concerns. Fatigue and Difficulty Sleeping: Many of my patients report increased energy and athletic performance. Others tell me they’re sleeping better than they have in years. By purifying your blood and increasing the efficiency and output of your brain and other organs, Ultra Greens gives you “power on demand,” and a restful night’s sleep. Wrinkles and Sagging Skin: I’ve seen noticeable improvements in skin tone and elasticity in the faces of my own patients. Ultra Greens, being a rich source of nucleic acids like DNA and RNA, provides your skin with age-defying nutrients. The result is smoother, firmer, more radiant skin – with fewer wrinkles and age spots! Muscle Loss: Bodybuilders love Ultra Greens. Its high quality protein boosts muscle mass and gives them extra strength to push their limits. Even if you’re not interested in weight lifting, Ultra Greens prevents muscle loss and gives you that added kick when you need it. Weakness and Digestion Trouble: The super foods in Ultra Greens mop up sluggish digestion and help promote healthy intestinal flora. This is critical, especially if you’ve been eating bread all your life. The difference in your energy levels – and your moods – once this is cleared up is worth taking Ultra Greens all on its own. With the rise and increase number of my patients being diagnosed with Diabetes, I have recently spent more time in drugs stores than I would like. Purely because I wanted to see what they had to offer the Diabetic patient! Well, Rite Aid, CVS and Walgreens all had large diabetes sections offering support for a “diabetes lifestyle”—glucose monitors, lancets, blood pressure cuffs, medications, supplements and pharmacy magazines heavily supported by pharmaceutical advertising. Patients are encouraged to get their eye check ups, monitor their blood pressure, track their blood sugars, have foot exams and see their doctor’s regularly for better management of their blood sugars—all apparently sensible advice for diabetics. But what if type 2 diabetes could be completely reversed? What if it wasn’t, as we believe, an inexorable, progressive disease that has to be better “managed” by our health care system with better drugs, surgery and coordination of care? What if intensive lifestyle and dietary changes could completely reverse diabetes? A ground breaking new study in Diabetologia proved that, indeed, type 2 diabetes can be reversed through diet changes, and, the study showed, this can happen quickly: in 1 to 8 weeks. That turns our perspective on diabetes upside down. Diabetes is not a one-way street. If we have a known cure, a proven way to reverse this disease, shouldn’t we be focused on implementing programs to scale this cure? We used to believe that once cells in your pancreas that make insulin (beta cells) exhausting themselves, there was no reviving them and your only hope was more medication or insulin. We now know that is not so. Continuing misconceptions about what causes diabetes and our unwillingness to embrace methods known to reverse it have lead to a catastrophic increase in the illness. Today one in four Americans over 60 years old has type 2 diabetes. By 2020, one in two Americans will have pre-diabetes or diabetes. Tragically, physicians will miss the diagnosis for ninety percent with pre-diabetes or diabetes. (Below I tell you exactly what tests to ask your doctor to perform and how to interpret them). From 1983 to 2008, world-wide diabetes incidence has increased 7 fold from 35 to 240 million. Remarkably, in just the last 3 years from 2008 to 2011, we have added another 110 million to the diabetes roll call. And increasingly small children as young as eight are being diagnosed with type 2 diabetes (formerly called adult onset diabetes). They are having strokes at 15 years old and needing cardiac bypasses at 25 year old. The economic burden of caring for these people with pre-diabetes and diabetes will be $3.5 trillion over 10 years. If we have a known cure, a proven way to reverse this disease, shouldn’t we be focused on implementing programs to scale this cure? Unfortunately despite this extraordinary new research, the findings will likely be pushed aside in favor of the latest greatest pill or surgical technique because behavior and lifestyle change is “hard.” In fact, with the right conditions and support, lifestyle diet and lifestyle change is very achievable. Reversing Diabetes: Can it Be Done in a Week? The article, entitled Type 2 Diabetes “can be reversed” was exquisitely done. http://www.bbc.co.uk/news/health-13887909 The bottom line: A dramatic diet change (protein shake, low glycemic load, plant-based low-calorie diet but no exercise) in diabetics reversed most features of diabetes within one week and all features by eight weeks. That’s right, diabetes was reversed in one week. That’s more powerful than any drug known to modern science. We know from gastric bypass patients that with rapid changes in diet right after surgery, within just a few days, without significant weight loss, diabetes goes away—fatty livers heal, cholesterol levels plummet. Some theorized it was because of changes in the stomach hormones related to the gastric surgery. Others, including the researchers of this new study surmised that maybe it was just the drastic change in diet. So they went about studying just the diet change without surgery. They studied 11 people with diabetes and compared them to a control group. Through very sophisticated techniques including MRI imaging, they measured their blood sugar and insulin responses, cholesterol levels and fat in the pancreas and liver (some of the hallmarks of diabetes) before and after diet changes at 1, 4 and 8 weeks. What they found was revolutionary. The beta cells—the pancreas’ insulin producing cells—woke up, and the fat deposits in the pancreas and liver went away. Blood sugars normalized in just one week, triglycerides dropped in half in one week and reduced 10-fold in eight weeks. The body’s cells became more insulin sensitive and essentially, in just 8 weeks, all evidence of diabetes was gone and the diabetic patients looked just like the normal controls on all the testing. While this may be surprising to most, it is something I see regularly with my patients. With focused, strategic, scientifically based nutritional intervention, combined with exercise, stress management and sugar and insulin balancing nutritional supplements, many of my patients completely reverse their diabetes. And the side effects—more energy, better sleep, improved sexual function and weight loss—are all good. What most don’t realize is that pre-diabetes and diabetes exist on a continuum and both dramatically increase the risk of heart attacks, stroke, cancer, infertility, sexual dysfunction, depression and dementia. You don’t have to get diabetes to be at risk for all those problems. That is why it is so important to get your doctor to diagnose pre-diabetes early and implement an intensive lifestyle program to help you reverse it. You may be at risk if you have extra belly fat, have a family history of diabetes, gestational diabetes, are in at risk ethnic group (Asian, Hispanic, African American, Native American, Middle Eastern), have high triglycerides (> 150 mg/dl) or a low HDL (< 50 mg/dl) or have high blood pressure. If any of these apply to you or you have other cause for concern, here is what to do. A 75-gram glucose tolerance test measuring BOTH glucose and insulin fasting and 1 and 2 hours later. Your fasting blood sugar should be less than 100 mg/dl and your 1 and 2 hour sugar levels should be less than 130 mg/dl. Your fasting insulin should be less than 10, and your 1 and 2 hour levels should be less than 35. Triglycerides should be less than 150 mg/dl and HDL (good cholesterol) should be over 50 mg/dl, and the triglyceride to HDL ratio should be less than 4. These ranges are meaningful only if you are on no medication. Newer cholesterol tests measure the size of your cholesterol particles and is very effective in diagnosing problems with pre-diabetes early. In fact, this is the only cholesterol test we should be performing. Remember, pre-diabetes and diabetes is not a one way street and the solution is not at the bottom of a pill bottle or the end of an insulin syringe, it is at the end of your fork and in the shoes on your feet! Do you think diabetes can be reversed? If so, how? What methods have you tried to gain control of your diabetes or weight gain? How have those methods worked for you? Why do you think accessible, scalable, lifestyle solutions like these that actually reverse chronic illness are not more frequently prescribed in conventional doctor’s offices? How can we change this? Does Organic Food Really Matter? It is my professional opinion that when it comes to our diet : YES Organic matters. Over the years society has turned to fast foods, refined foods, junk food, soda, candy and whatever happens to be conveint. With such a change in our diet we have seen a drastic increase in Cancer, Autoimmune Disorders, ADD/ADHD, Diabetes, High Blood Pressure, and many more disorders. The old adage, you are what you eat is coming to light! Remember, your diet is at least 65% of your health. Change your Diet, Change your Health! More Information: Call Dr Elena Morreale (Alternative Cancer and Health Therapies, Tampa, FL) 813-968-5404. MONTREAL, June 14, 2011 /PRNewswire/ – Immunotec Inc. (TSXV: IMM) (www.immunotec.com/IRL/Public/en/CAN/science_research.wcp) announces that data from research using Immunocal® in a mouse model by Principal Investigator Daniel Linseman, PhD and his team at the University of Denver in Colorado shows promise in delaying the onset of amyotrophic lateral sclerosis. Investigators studied mice harbouring the gene that is responsible for some forms of the disease commonly known as ALS or Lou Gehrig’s disease, a progressive neurodegenerative disease that affects nerve cells in the brain and the spinal cord. The data demonstrates for the first time that supplementation with Immunocal may be effective in preserving blood glutathione levels which typically diminish in affected mice. Immunocal, a whey protein isolate, is Immunotec’s flagship product. Immunocal is a patented natural nutritional supplement that is clinically proven to raise and sustain the body’s concentration of glutathione for the maintenance of a strong immune system. “This independent research initiative and the preliminary results are very encouraging and we look forward to future opportunities to collaborate in preclinical and clinical development,” says Immunotec Vice-President of Research and Development, Mr. John Molson. While ALS is a relatively rare disease – a total of approximately 33,000 Americans and Canadians are currently affected – it is fatal, with eighty percent of people with ALS dying within five years of diagnosis. Even in its early stages, the disease runs a very difficult course, making it difficult to breathe or swallow. Especially in the United States, costs for medical care can be significant, particularly in its late stages. Research team member Erika Ross presented the highlights of this study in a poster, “A non-denatured whey protein supplement (Immunocal®) protects neurons from mitochondrial oxidative stress and delays disease onset in the mutant SOD1 mouse model of ALS” during the recent Keystone Symposia on Neurodegenerative Diseases in Taos, New Mexico. The overall findings indicate that Immunocal significantly protects cells from oxidative stress through glutathione synthesis. The full poster can be viewed at www.immunotec.com. Hello and welcome to the News section of our website. Here you will find current and interesting articles that we hope will support and supplement your wellness plan. If you would like to learn more about a particular subject, please let us know and we will do our best to post information and news relevant to that topic. We would also like to hear any feedback you might have, so please don’t hesitate to use the “Leave a Comment” link below each post. Thank you and we look forward to staying in touch! Providing services of apollo pharmacy, apollo pharmacy chain, apollo pharmacy in India, medical pharmacy store, medical store in India, pharmacy store in India buy Sporanox online MI Department of Licensing and Regulatory Affairs – information about the pharmacy licensing process in Michigan.